Pie Crust: 2 1/4 cups all-purpose flour, plus more for bench and cutters. 2 tablespoons sugar. 1/4 teaspoon fine sea salt. 2 sticks chilled unsalted butter, cut into 1/2-inch cubes... Grab your supplies and hit play in your iPod!. Set your oven to 200°C or 390°F. I like to roll my pastry out on a piece if baking paper- saves on clean up!!!. 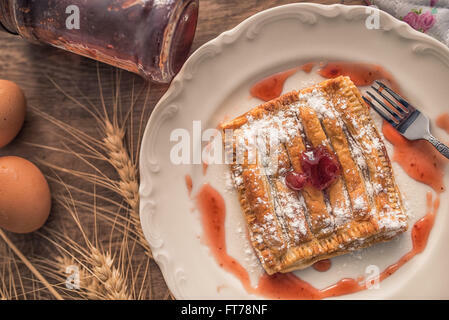 Make and share this Cherry Pie With Canned Cherries recipe from Genius Kitchen.... Get supplies and preheat oven to 425. Unroll one pie crust and fit to the bottom of pie pan. Take two cans of cherry pie filling and put on top crust. Add second pie crust to top, pinching sides together and cut slits in top. I’ve made numerous pies since that first one, but I finally decided to make a cherry pie. Naturally, with plans to make my own pie crust, lattice and all, I couldn’t open a can to fill it with. Besides, cherries are in season now, and absolutely delicious. I can’t believe I considered that in the past!